November has been a slow blogging month. I went to Gorditas Lupita this week so expect that review shortly. Until then here are the new taco truck rankings. El Chato remains on top with Tacos Leo dropping a few points (possibly due to the lack of al pastor spit on weekdays). El Matador climbs from #5 to #3 with La Korita dropping to #4. Taco traditionalists have spoken and Kogi has been knocked out of the top 10 and replaced with La Estrella. 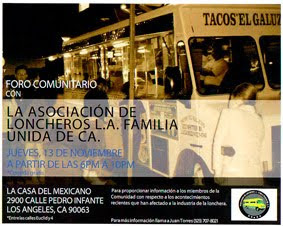 Tacos Tamix, LA’s best tacos al pastor is seeing little love from the voters (3 votes 5.0). Keep voting! New rankings are released on the first monday of each month. Nothing can match Tacos Leo on the weekends when the pastor spit is out. It beats the hell out of El Chato's any day. Plus next to Leo's is a guy selling 3 for $10 DVDs of movies that aren't even out yet! hey Bandini. 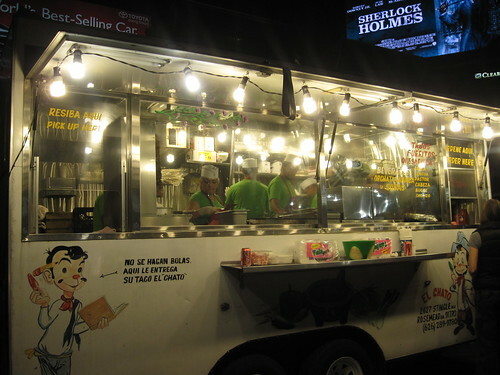 I'm writing a 20 paged paper on taco trucks in los angeles and I just wanted to say this blog has been a big big help. keep doing what you're doing! When I get back in LA I'm hitting up all these places. I was not overwhelmed by Chato a year or so ago. Guess I have to go back. Still really really LOVE the Pastor at El Tauro. Gotta get to Leo too on the right night! Good work!